As many of you may remember from the 1998 Summer newsletter, that was the 75th anniversary year of Little Sebago Lake Association’s first annual meeting held at Camp AimHi of Sept. 6th, 1924. Since that time, the association (made up from hundreds of concerned volunteer lake property owners over the years) has strived to keep Little Sebago Lake a safe, clean, stable natural resource that can be enjoyed by everyone. The individual tasks are different now than they were in 1924 when there were committees for fishing, ice harvesting, firewood procurement and road maintenance. Today we have committees for water quality testing working closely with the DEP and Portland Water District; a committee for lake issues to stay abreast of zoning changes and legislative matters, a lower narrows committee who developed a plan, procured permits, and carried out dredging of the lower narrows this winter. We have people who work with the design and purchase of promotional items to raise money for buoys, signs, police protection and safety patrol boat. There is a group that develops, prints, and mails the newsletter. We are active in connection with the lake’s road associations and have a representative that works with island owners. The Association is involved with COLA and the Maine Audubon Society. 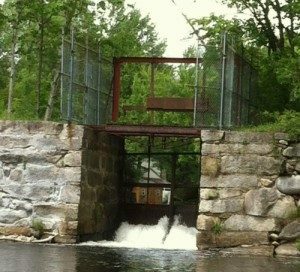 We own our dam and have developed a dam emergency plan such that a warning system is in place should a breach of the dam occur. We own a safety patrol boat and set buoys to promote responsible watercraft use as well as life/safety and property protection. We are incorporated as a not for profit corporation, have legal council and an accountant. Many things have changed since 1924 but our main priorities have remained the same; a safe, clean, well managed lake for the use of all. The first meetings of LSLA took place in Sept. of 1923 when summer residents and property owners got together to form an association for the “mutual benefit and advantage” of the group. Dr. Frank Gilbert was elected chairman and in 1924 became president of the Association. Through the fall and early winter of 1923 a number of meetings occurred leading to the formulation of committees to deal with roads, ice, wood, fishing, and membership. In addition a set of by-laws was developed that are not that different in their intention and purpose than we work with today. Membership dues were set at $2.00 annually and an additional assessment of $5.00/cottage levied for those who used the main wood road on the East side of the lake to be paid to the Road Committee. The treasurer’s report for the beginning of 1924 shows $60 in membership funds and $87.50 in the Road Committee account which was promptly spent on road repair. The first annual meeting Sept. 6, 1924 at AimHi found the Ice Committee a profitable venture at $0.14/cake, the Wood committee’s service unsatisfactory, the road on the East shore in good repair thanks to the Road Committee and 1000 small-mouth bass stocked in the lake. There was concern about too many picnickers and strangers coming down the newly repaired road and voted that warning signs should be erected. Meeting attendance, 29. In 1925 meetings were held at Camp AimHi and it was voted to restrict usage of the East side road by shutting off two entrances and erecting a gate and more signs. The membership treasury had swelled to $116.65 and road fees went up to $6.00/cottage. No mention in the annual minutes of the ice, fishing, or wood committees. No meeting minutes were available from 1926-1931 but treasurers’ reports indicate road fees were remitted and spent. Aug. 31, 1932 a meeting was called by the president (still Dr. Frank Gilbert) to discuss disposing of the association and it’s funds. It was voted to keep the organization together for the purpose of the East Shore Rd. ; the only function determined to need coordinated effort. $6.00 in membership dues were returned to people not residing on the East Shore Rd. and the remainder of the treasury ($54.94) was transferred to the road committee. In August of 1933 it was voted to stock the lake with 50,000 salmon fry and 25,000 rainbow trout at a cost of $200. Sept. 17, 1933 marked the last annual meeting of the Association as it was known. At that meeting the name was changed to “Hunger Bay Association” still with Dr. Frank Gilbert president. Treasurers’ reports from 1934-1940 show moneys collected and spent on road repair but no meeting minutes. From 1940-1947 no association records are available. As of 1948 there were changes in the officers of the Hunger Bay Association and minutes are again available going through 1955 showing work on the road the only activity. A new project was brewing however, which will reunite LSLA with a new and ongoing purpose as a permanent entity. There is a letter in the archives dated November 8, 1950 to Norman Hodgson of Camp Aimhi from a L.T. Timberlake. The letter refers to negotiations over a couple year period Mr. Timberlake has had with Joseph Warren of S.D. Warren Co. who was at that time in control of dam rites for Little Sebago. The letter makes it clear that he felt members of the newly formed LSLA had gone behind his back to meet with Warren directly on purchase of the dams; and that he, not they with their “sharp dealings”; had negotiated the purchase of both dams and surrounding property for the price of $2,500. However in the letter Mr. Timberlake specifically states that he has no further interest in the transaction and makes the statement that if LSLA does buy the property and dams they will be held responsible and accountable for dam reconstruction, maintenance and property values. It references a dam breach of the lower lake (Collins Pond) some 15 years prior, (1935) that left the lower basin a mud flat which was rebuilt from Timberlake’s own material with the help of the W.P.A. In August of 1950, LSLA became a corporation with a new president, Norman Hodgson of Camp Aimhi, and a new mission; raise enough money to purchase the dams from S.D. Warren and accept the responsibility of maintenance and operation. There was a call to all lake property owners to contribute to the cause and purchase share certificates issued for $10 per share. By the end of the June 17, 1951 annual meeting, 226 shares had been sold; not quite enough for the dam purchase but well on the way to the $2,500 goal. A copy of the deed in the archives shows the purchase consummated May 26, 1952. The lower dam, property around the lower dam and on the lower basin was eventually sold to help pay for the cost of the main dam and it’s refurbishment. Further historical information about our Association including maps, deeds, share certificates, articles of incorporation and past by-laws are on file. No historical recounting of LSLA would be possible without giving credit and thanks to all of the Association members who have shared their views, ideas and time over the years. A big THANK YOU goes back from the present LSLA board of directors to all of you in the past who have given of yourselves to bring the organization to where it is today.